Two small finds on a cold, rainy day at the Brimfield flea market. Both are from the 1930s, both are taverns, and both conjure up bygone days. But beyond that, the two – one representing a chain of German-themed restaurants and the other a small-town tea room – have little in common. 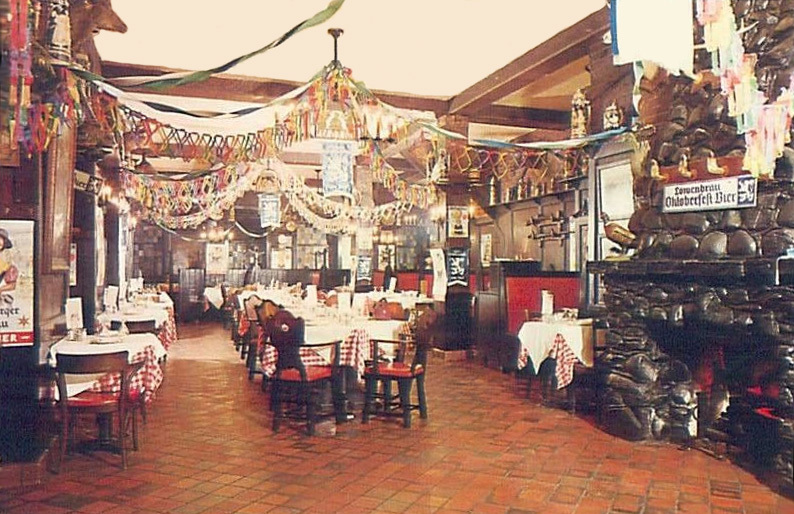 Steuben Taverns was a chain of pseudo-Bavarian restaurants located in big cities. 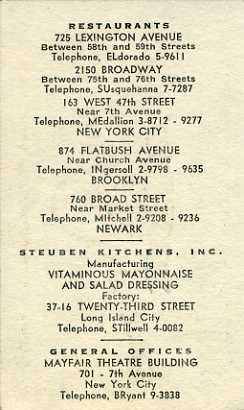 The first, on 47th Street, was opened in New York City in 1930 and was the longest survivor of the moderate-priced chain, staying in business until 1971 [the postcard of the interior below is probably of the 47th Street place]. At its peak the chain had about a dozen restaurants, mainly in NYC but also in Newark, Baltimore, and Philadelphia. The business encountered a few bumps along the road. Opening a huge, block-long unit in Times Square in 1934 proved difficult, dragging out to 14 months, because the restaurant was located over the Times Square subway station, which had to be redesigned. Despite selling a lot of beer (Prohibition had just ended) and seating 800 customers, the Times Square Steuben Tavern failed just five years later. Meanwhile the chain suffered more grief in 1936 during a mobster shakedown that affected a number of high-profile NYC restaurants. As a chain the Taverns allegedly paid a particularly high sum – $17,000 – to ensure that the racket leaders did not carry out their threats to send “union” picketers or set off stench bombs. 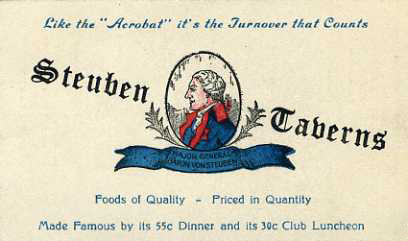 Strangely, given its German theme, the Steuben Tavern in Newark evidently entertained many Jewish patrons in the 1930s. On September 14, 1934, with the Nazis in power in Germany, the restaurant took out an advertisement in Newark’s Jewish Chronicle wishing its patrons the best for the Jewish holidays. It was almost as though the White Gate Tavern was in another country altogether, one without beer, racketeers, or subway stations. 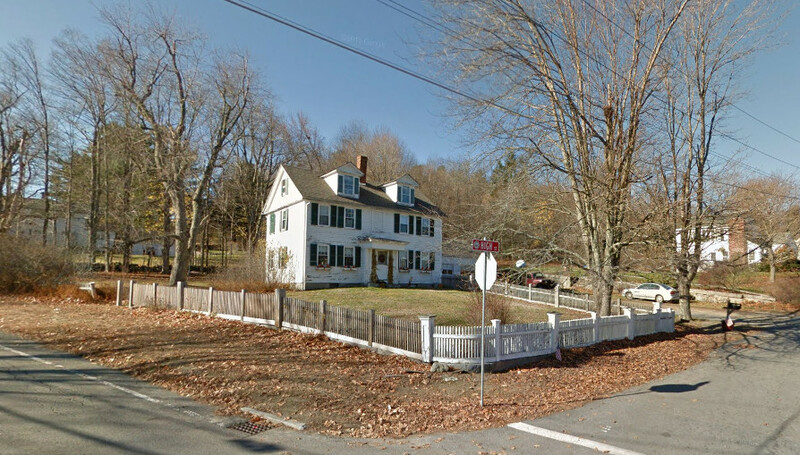 It began in business in August of 1932 in the town of Ashburnham, Massachusetts, in a 100-year-old house formerly occupied by a Latin teacher at the town’s private school, Cushing Academy. Its proprietors were two unmarried middle-aged women, both of whom had worked for the Y.W.C.A. at one point. Ida J. Lyon was from Connecticut and, as a member of the Daughters of the American Revolution, a bona-fide Yankee. Her partner, Helen G. Cowell, was the daughter of the late but long-time principal of Cushing Academy. In the next few years, further improvements were made to the White Gate Tavern. A yarn shop where knitting lessons were given was opened in a finished room in a barn adjoining the house. In 1935 the interior of the house was renovated and the kitchen was enlarged. A so-called Peasant Tea Room was opened in the barn, along with a “Sunbeam Shop,” a gift shop with crafts made by villagers. 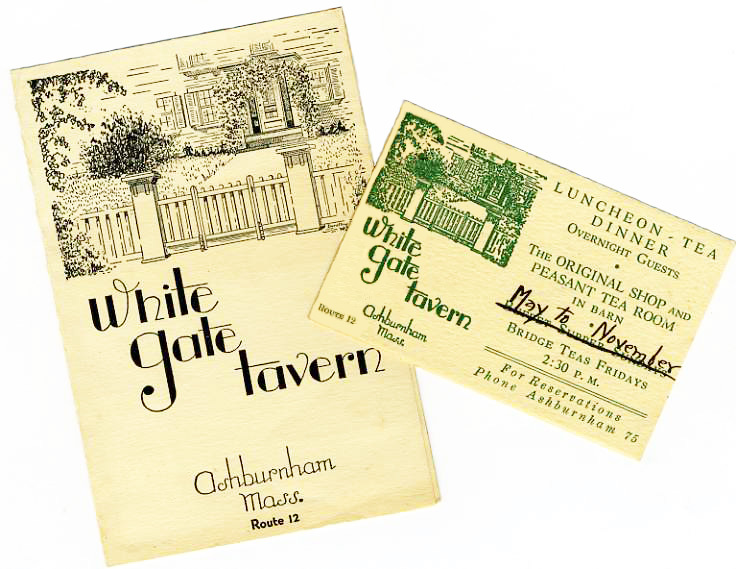 The White Gate Tavern probably closed in the late 1930s. I could find no trace of it after 1937 — the local newspaper carried no further notices of its annual opening for the season or the usual lists of guests who stayed there. The house is still standing and from the outside likely looks much like it did in the 1930s.